Hello everyone, I'm here today with a cute card I made for someone special. I'm popping this in the mail to my friend for Valentine's Day! I started by inking the globe shape using an A2 sized piece of paper that I cut the shape out, then layered it over my cardstock and sponged on Shaded Lilac in an ombre look, darker at the bottom and light at the top. I copic colored and die cut using coordinating dies, the images from Sending Hugs. The amazing thing about the coordinating dies is that it cuts out the arms and so you can slide the little accessories in, like the wine, flowers or gift box. I added a red balloon from the Fabulous Frenchies stamp set too. To finish it off, I added some hearts and then stamped the sentiment below. Thanks so much for stopping today, make sure you visit the store and check out these super cute stamp and die sets! 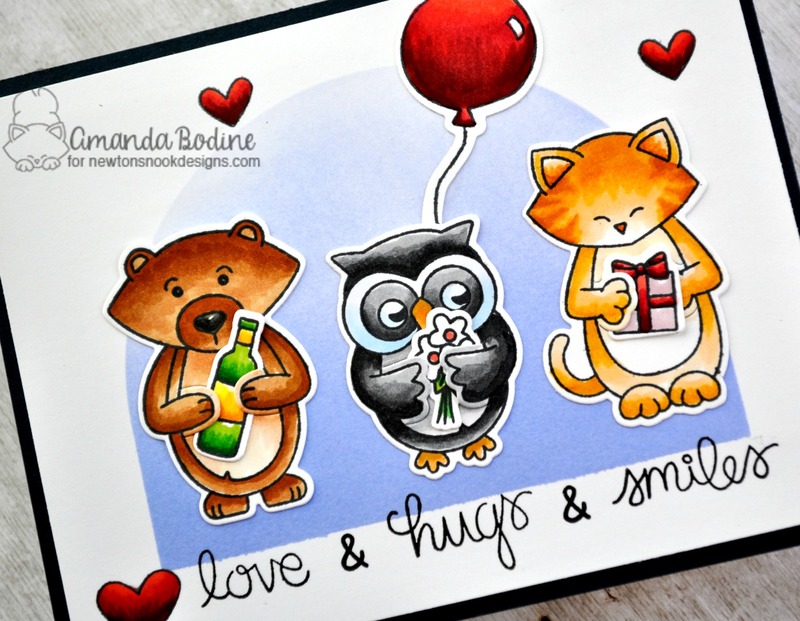 Those three friends look so adorable bearing gifts held in their hands! Such a fun card!